“Miracles worked by an Avatar are actions of His Consciousness from the state of Mergence with the Creator. Chakras inform our ‘physical and subtle bodies’. Chakras Inform our 4 bodies. With them functioning in harmony we are healthy. It takes daily honesty and practice to become a conscious, responsible human being. Understanding your fellow human requires the ability to put yourself in their place, to see things as others see them. There is a great difference between knowledge and understanding. The seat of knowledge is in the head but the seat of understanding is in the heart. 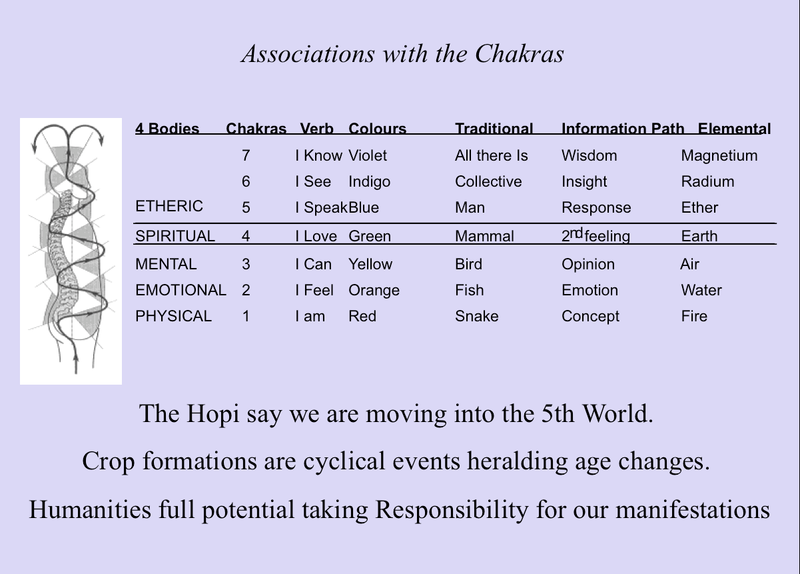 The Chakra system is key to understanding how YOU work. It can be confusing, so I hope to help. Below you can see the basic back to back rainbow vortex system of main 7 chakras and a diagram related to your subtle body development. 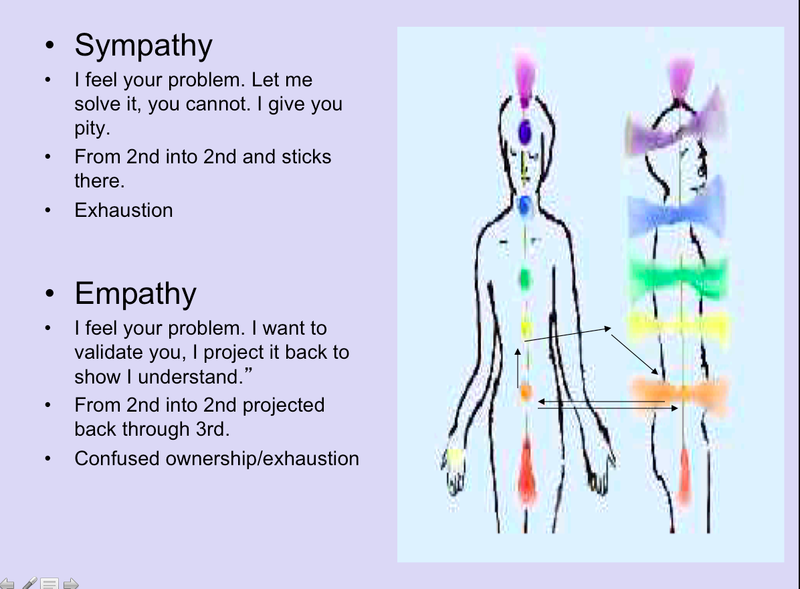 These two simple charts work together as the subtle bodies are layered over, or nested around the physical body and connected and fed by the Chakra vortexes. This creates a torus as the Chakras push and pull Life Force/God/Information up and through our system. We now understand that in our world all is constructed of light; faster or slower moving waves/particles of light. The most dense body is your Physical with the lowest light frequency. Your least dense body is then your Spiritual with highest light frequency. Frequency meaning the number of cycles, or completed alternations per unit of time, of a wave or oscillation. So LIGHT or ENLIGHTENMENT could then be seen as having all your chakras lit up so to speak. Below is the diagram describing the concept of the 4 Bodies. We all enjoy 4 bodies but mostly focus on the Physical one. These bodies go through a maturation process as we age. I suggest this is why in most traditions one cannot enter into the Shamanic practice till one is Spiritually matured or over 40. Try to imagine that you are more than just your Physical body. You live in an Emotional, Mental and Spiritual one as well. These more subtle bodies are connected to our physical one and fed by our Chakra systems. Each Chakra is associated with a certain gland and nerve plexus in the Physical. 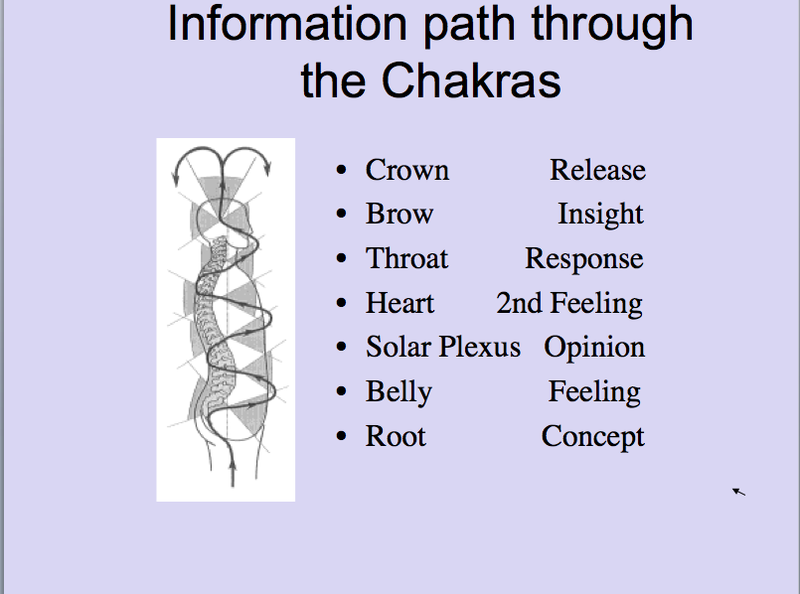 Chakras drive our Information Path up and through the bodies. We process our experiences and environmental data through our Chakra ‘databases’ all day long. The information arrives in our system of consciousness at the ROOT as a CONCEPT. This is correlated to the Physical Body. If our systems are healthy we can pull the information up into the BELLY and we find we get a certain initial gut FEELING about this concept. We encounter SYMPATHY. This engages our first subtle body the EMOTIONAL. Next the information moves to the SOLAR PLEXUS activating our MENTAL Body and we form an OPINION. We feel EMPATHY. One can easily stay stuck here as our society values the intellect highly. If we draw the information up to the HEART we engage the Spiritual Body and our 2nd FEELING or COMPASSION. The importance of using COMPASSION over SYMPATHY and EMPATHY is crucial to maintaining health. It empowers the other with your belief in them, rather than ‘de-powering’ them with your pity and interference. One can get caught up in mental and emotional games this way. The image below is a simple example of the relationship to these as energy flows. Once we are past the HEART we move on to the THROAT associated with the purely spiritual realms of Vibrational Consciousness. Interestingly this is the realm of SOUND. Our vocal response. The first phase of manifestation. Sound creates form in the physical world. See this description of CYMATICS. As thoughts prompt us to make sounds which create, it behooves us to create beautiful and harmonious sounds. There is a key difference between a REACTION and a RESPONSE. It is our ‘responsibility’ to know the difference. REACTION, I suggest is unconscious and RESPONSE, conscious. The BROW Chakra is where we encounter INSIGHT. Here we experience the AH HA moments. Here is where the our 3rd Eye (pineal gland) can see ‘truth’ from. Here we access Wisdom. The CROWN in healthy mode will RELEASE the now processed CONCEPT. This release allows the re-rooting of new conceptual wisdom for others to pick up on. One can now say they have an UNDERSTANDING or they are ‘standing under’ a processed concept. By processing our personal information we provide fully processed concepts back to world. Do you have pain between the shoulder blades? Do you have a sore throat? Indigestion? These are places the flow can be blocked. 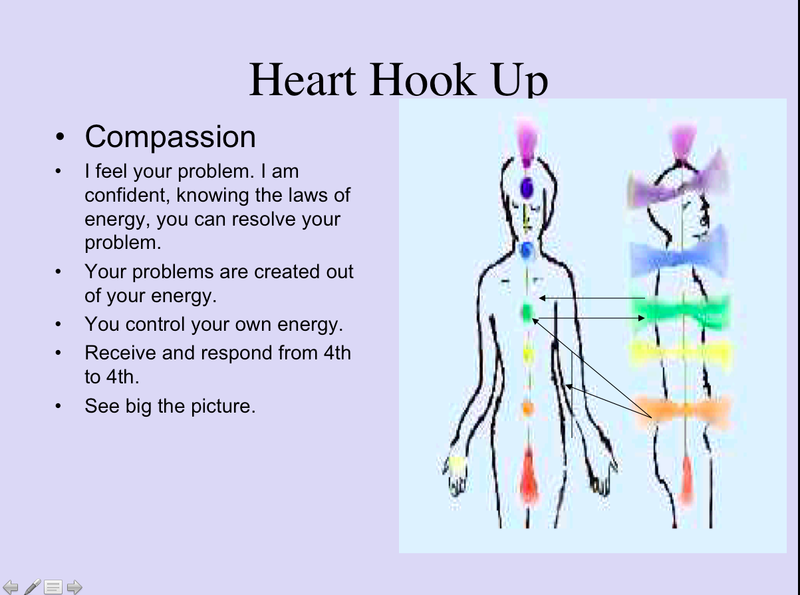 The back to back push/pull of healthy chakras can be stalled out. At any point in the information path, we can stop the process. The ‘holding up the line’ so to speak, creates static energy as opposed to dynamic. Just as standing water will house disease unlike flowing water which stays clean. This stand still allows the formation of DIS-EASE in the bodies. We will first get the message about a potential DIS-EASE state in our SPIRITUAL Body. If we do not hear, the message moves to the MENTAL BODY. If we ignore it’s move to the EMOTIONAL we will form a DIS-EASE in the PHYSICAL Body. On my 50 year quest to discover the “who what where why and how” of my human family, I stumbled across some very interesting information in a book by Robert Monroe called Journey’s Out of Body. He also wrote a second book I enjoyed called Far Journeys. These books were recommended to me by a friend after spontaneous OBE’s (Out of Body Experience) started to happen to me at work on night shifts. During this time trying to stay awake prompted the perfect wake/sleep state I needed to access an OBE. This book introduced me to a world of Vibrational Levels of Consciousness. I soon realized this was a map of the places we can all travel once we realize we can leave and return to our physical body at will. In this awareness we are what I have come to call IS-BE. Our true nature, pure consciousness or light. Once I drew this map out it seemed to resemble nesting spheres. I find this interesting as I imagine the body’s Chakra system to also be nesting spheres. All at once I realized that the vibrational levels of awareness or consciousness could be correlated with chakras, frequency, sound, colour, gems and even glands in the body. The chart below, from my Power Point lecture Rainbow Road, has a simple stratified offering showing some of these correlations. 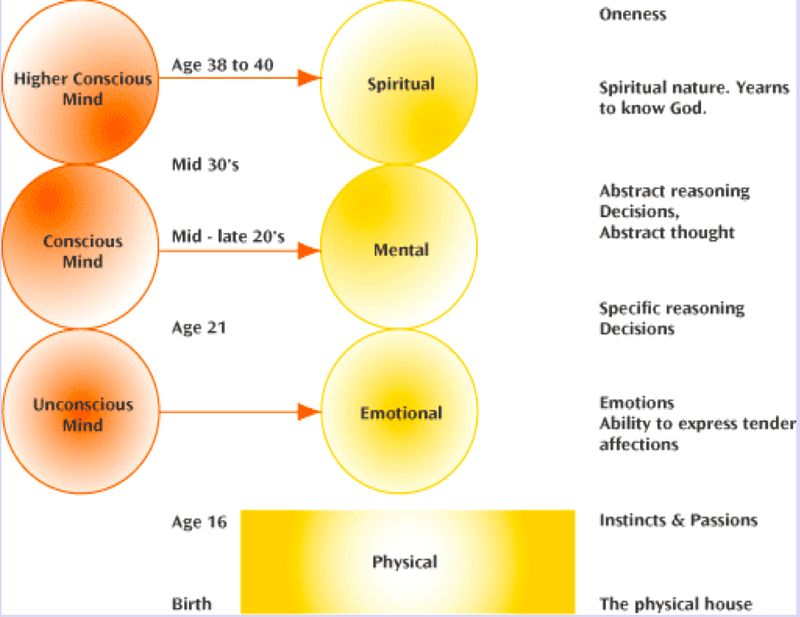 This chart below is a simple diagram showing the Vibrational Levels of Consciousness from Monroe’s description. Each vibrational level has 7 ascending frequencies. We call someone acting badly an ‘animal‘ right ? 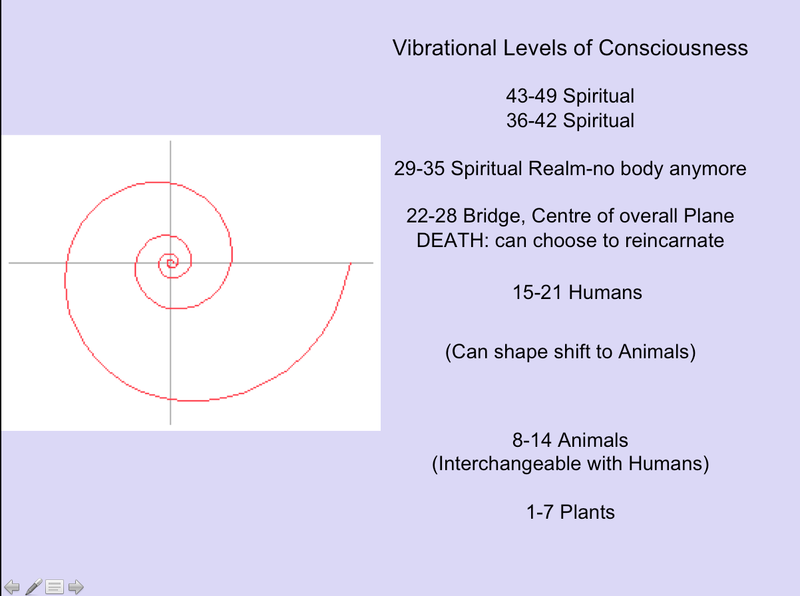 I suggest the human vibrating with the lowest possible human frequency is closest to Animal Consciousness. In the same regard, if we are motivated to ascend to vibrational conscious levels at the higher end of the human spectrum, we have more ability to commune with the spiritual realms. 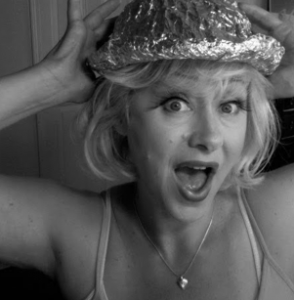 Like attracts like, so being aware of our consciousness can be helpful. So let’s explore it from the Seed to the Higher self….. I think these Russian Nesting dolls are a great reminder of this ‘nesting spheres and bodies concept. Starting at the imagined centre of the nested sphere we see Plant Consciousness. Isn’t it wonderful to think of the small encapsulated seed consciousness as the number one. We can imagine all levels of plant life up to amazing plants like the Venus Fly Trap at 7! Human Consciousness has it’s 7 levels too. We all relate to differences in our fellow humans consciousness. Ranging, I suggest, from animalistic to spiritual. This quote aptly describes the need for our vibrational consciousness to to be steered upward. According to Monroe’s information, on the Human level when one dies, next one finds oneself on the bridge. This is the Death Bridge. It correlates with the Heart Chakra. I liked this as it relates to the Death of the EGO. Ego death is required to ascend to the Spiritual Power of the Upper Chakras. 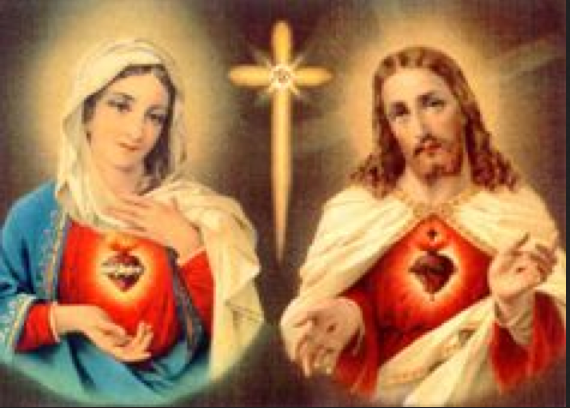 I notice Jesus and Mary are oft times portrayed with a flaming Heart of Compassion. I feel this represents the needed frequency to overcome EGO and move to the Spiritual realms. Their hands suggest the ‘as above so below’, or path from the base Physical realm below, through the Heart which burns away the base, to access the Spiritual above it. From this level we can reincarnate or choose to ascend even higher. Moving higher results in the loss of the ability or need to reincarnate here on Earth. Each of the higher levels also contain 7 frequencies. To become of aware of our current Vibrational Level of Consciousness and personal chakra/4 body information sorting process is how we can stay healthy and become of most service. It takes daily honesty and practice to become conscious and responsible human beings.